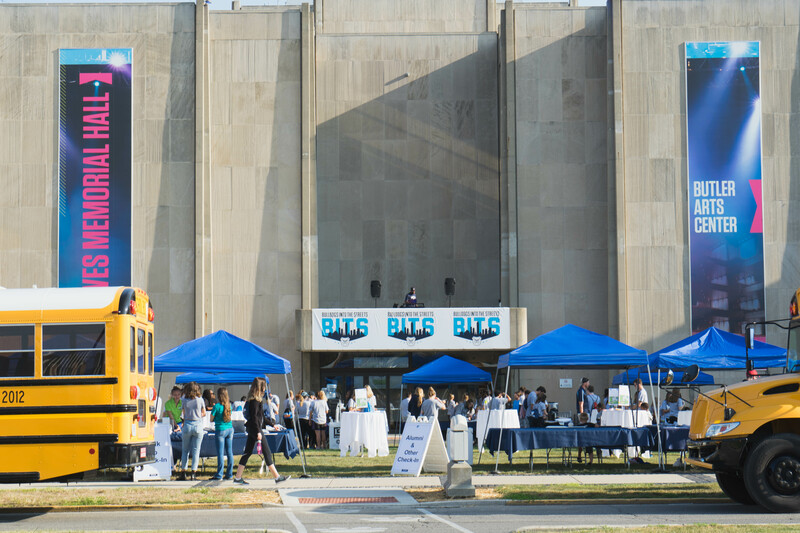 BITS registration in front of Clowes Memorial Hall on Aug. 26. Photo by Adam Cvik. Bulldogs into the Streets had a little more than 1,400 participants this year, about a 100-person increase from record-breaking numbers last year. On Saturday, Aug. 26 Butler students, faculty and Butler alumni completed 49 different projects — 46 of those were off campus — Caroline Huck-Watson, PuLSE office director, said. Mary Plymale, fourth year pharmacy major, co-chaired the event this year. This was her fourth year participating in BITS, and she is also the vice president of philanthropy for Alpha Chi Omega. This was the first year she was not able to go to any of the sites. She had to stay on campus to handle any problems that may have come up. But luckily, she said, there were no major issues. Her biggest worry was the weather. Last year, some sites were rained out — including junior political science major Ted Field’s White River project. This year, though, he was able to participate. He visited St. Vincent de Paul, where he mostly helped organize the thrift store. He said BITS is something he plans to do next year. Kelsey Thomas, fourth year pharmacy major, has participated in BITS for three years. “I keep coming back each year because I love being surrounded by so many other Butler students who, like me, are genuinely excited to be spending their Saturday volunteering in the community,” she said. This year, she volunteered on campus. Located in Fairview House, she made dog toys out of old T-shirts for the Indiana Canine Assistant Network. While volunteers are assigned to specific sites, Plymale said they can put in special requests on their applications. First, those with certain disabilities are given priority. Then, requests to work with friends, sororities or sometimes even majors are honored. Thomas requested to be placed with a couple of her friends. Deborah Ebbinghaus, fifth year pharmacy and spanish double major, was one of those people. “As we were making the dog toys, we got to give them to some of the dogs and see them playing, knowing that we were making a difference and seeing that immediate response,” she said. She noted some of the changes in BITS since her first year at Butler. She recalls BITS’ recent emphasis on reflection pieces. The dogs with ICAN, prior to the craft session in Fairview, had no toys to play with, she said. Most volunteers travelled off campus, however. Students and alumni also ventured a few minutes south to Shortridge High School. Lori Armstrong, partnership coordinator at Shortridge, said volunteers did anything from scrubbing walls, to pulling weeds in the courtyard, to organizing the theatre department. The previous two years, Ebbinghaus worked at Shortridge where she helped sort through sheet music and their drama closet. She hoped to go back there for a third year, but said she enjoyed trying something new. Armstrong said the high school values its partnership with BITS. “In my role of supporting our Shortridge families through the high school years, BITS day is an opportunity for me to reflect on that ‘end game’ of preparing our scholars for college and career,” she said. Participants volunteered at other schools as well, including the Butler Lab School. Others went to Gleaners Food Bank, Ronald McDonald House, Tarkington Park and Martin Luther King Community Center. BITS’ reach even extended as far as Chicago, where a Butler alumni chapter volunteered in Lincoln Park. By the end of the day, volunteers completed almost 4,300 hours of community service.